SITE 2016 in Savannah, Georgia, March 21-25, is the 27th annual conference of the Society for Information Technology and Teacher Education. This society represents individual teacher educators and affiliated organizations of teacher educators in all disciplines, who are interested in the creation and dissemination of knowledge about the use of information technology in teacher education and faculty/staff development. SITE is a society of the Association for the Advancement of Computing in Education (AACE). 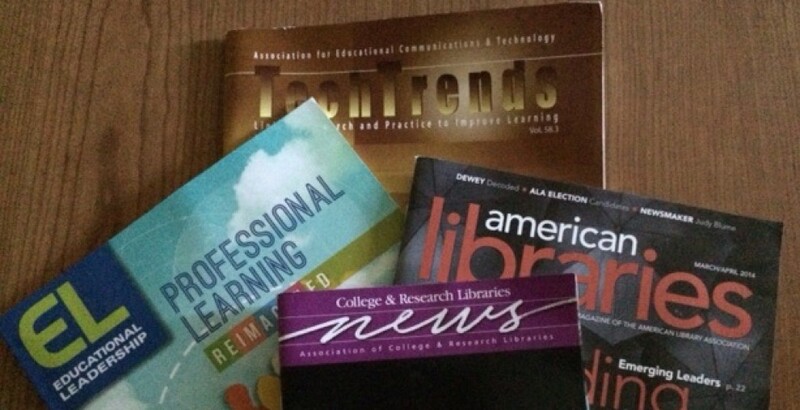 Do you (or have you) designed information literacy programming for an academic library? We are seeking short case-studies (750-100 words) for an upcoming publication by ABC-CLIO/Libraries Unlimited, scheduled to be published in 2016. Case-studies will highlight the challenges and opportunities of information literacy programming in today’s complex academic environment. http://go.umd.edu/Zo7. Submissions will be accepted through May 22, 2015. Once notified, final case studies will be due September 4, 2015.
those that have worked with first year programming, in ways both big and small. have worked through them, but we understand that sometimes the most valuable experiences are those that do not turn out as we expected! The one-day preconference will be an opportunity for those of us working with digital libraries/digital scholarship in liberal arts colleges to work closely together, in the spirit of the liberal arts seminar, to consider the issues and opportunities unique to us. We invite proposals for panels, presentations, or working sessions that foster conversation, connections, and provocation at the intersection of digital libraries and the liberal arts. How does your project or approach take advantage of the liberal arts environment, or respond to its limitations? How is your work informed by the values of a liberal arts college? What is the role of liberal arts college institutions in the digital library/digital scholarship world? Complete proposals should be submitted using the online submission form by 5:00 PM EST on June 22, 2015. Proposals must include a title, session type, information for each presenter (name, institution, and email), proposal description (maximum 300 words), and proposal abstract (maximum 100 words). You will hear about your proposal status by mid-August. The 2015 DLF Liberal Arts Colleges Preconference will be held October 25 in Vancouver, BC, at the Pinnacle Vancouver Harbourfront Hotel. The 2015 DLF Forum will be held October 26–28, and the Forum call for proposals is also open until June 22. Can public libraries, school libraries, academic libraries, and special libraries collaborate to promote information literacy and lifelong learning? Lifelong learning is not confined to childhood or the classroom, but takes place throughout a range of situations in life including the workplace. How do libraries of all kinds best engage with their communities and make creative partnerships to meet the challenges? What has worked for you and your colleagues in helping children / students / teachers and faculty / job-seekers / veterans / seniors and more when teaching lifelong learning? How have you reached out to those in various library institutions to help each other with such efforts? Share your innovations, experimental attempts, successes and failures. Kathy Gould, Director of the Palos Verdes Library District, will be the keynote speaker at the second annual LILi conference. Ms. Gould will address public library partnerships with schools and other community organizations, and how we work together to enhance both information literacy and lifelong learning. A panel of librarians from other types of libraries will react to her talk with ideas for bringing academic, school, and special libraries into the mix. The aim is to highlight a crucial area for cooperation and collaboration among different types of libraries toward a common goal: offering supportive, sequential information literacy instruction (ILI, including lifelong learning) for all levels and in all types of libraries. The conference is technically co-sponsored by IEEE Poland Section. All registered papers will be submitted to IEEE for inclusion to IEEE Xplore as well as other Abstracting and Indexing (A&I) databases. innovations to enrich the learning and adoption process. practitioners, researchers and scientists in the development arenas. development amid this rapidly evolving landscape. presentation, invited talks and collaborative discussion forums. in many peer reviewed and indexed journals. • Case Studies and Methodologies: stCSM 2015. • Action Research and Action Learning: ARAL 2015. • Interdisciplinary Research, Education, and Communication: IDREC 2015. • Integration of Research, Education, and Problem Solving: IREPS 2015. • Qualitative Research and Methodologies in Science and Engineering QRMSE 2015. • Research and Consulting: R&C 2015 (Research via consulting and consulting via research). • Pre- and post-conference virtual session. • Access to reviewers’ comments and evaluation average. • Waiving the registration fee of effective invited session organizers. • Publication of best papers in the Journal of Systemics, Cybernetics, and Informatics (JSCI), which indexed in EBSCO, Cabell, DOAJ (Directory of Open Access Journals), and Google Scholar and Listed in Cabell Directory of Publishing Opportunities and in Ulrich’s Periodical Directory. (All papers to be presented at the conference will be included in the conference printed and electronic proceedings). Address: C.C. El Placer II, Office 5, Caracas, Venezuela. ** Assigned editors work with the author(s) to make sure the article is as strong as possible, that the copy is clean, and deadlines are met. They also enter the article into WordPress, making sure the formatting is okay, all images and tables look good, etc. * Take a turn as Coordinating Editor for an Issue. The Coordinating Editor shepherds the issue through its life cycle. If you have any questions, contact us by email at journal@code4lib.org or ask any member of the editorial committee (listed at http://journal.code4lib.org/editorial-committee). We plan to make decisions about additional editors by mid May. Proposals for the Northeast Chapter of PaLA Spring Workshop, taking place on June 5th at the University of Scranton, are due Friday, April 17th. We hope that you will consider submitting a proposal for a session, whether you are part of the Northeast chapter or any chapter throughout our state! Our theme this year is Today’s Librarian. We are seeking to showcase and explore the new and innovative ways in which librarians are meeting the challenges of 21st-century librarianship. Please contact Sylvia Orner at sorner@albright.org with questions or for more information. Legislative IT policies and their effect on libraries. While we welcome proposals on these topics, we are open to any ideas you may have or any area of technology you’d like to explore.